Kavsan Ayakkabi SAN VE TIC A.S is a Turkish company that owns GREYDER - an international footwear and accessories brand. The brand offers medium to high priced footwear for men and women aged from 16 yrs and above. The brand expands through stores ranging in size between 90 to 150 sqm, located within shopping centers, retail parks, department stores, outlet centers and on prominent high street locations. With 60 years experience in footwear production and retail, today GREYDER is sold worldwide throughout over 380 sales points. The brand is present in Turkey with a retail network of over 100 stores and an additional 22 stores in Azerbaijan, Iran and Romania,,Kosovo,Macedonia,Suudi Arabia, Algeria, Kazakistan, Russia, Oman etc. GREYDER is well known for its high quality 100% leather products, its large production capacity, as well as by its elegant and comfortable styles following the latest fashion trends. 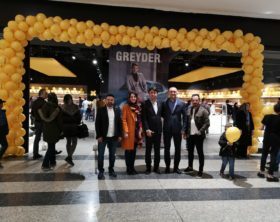 Greyder, an international footwear and accessories retailer from Turkey, opened its first stores in Iran and Iraq, increasing its retail network to 118 stores. This year Greyder will enter new markets including Montenegro and Albania. Greyder, an international footwear and accessories retailer from Turkey, is seeking to expand its presence in Estonia, Montenegro , Latvia, Bosnia and Herzegovina, Albania and Croatia in 2019.